Veterans Day 2018 was on Sunday, November 11th, 2018 and designated as a Federal Holiday on Monday, November 12th, 2018. 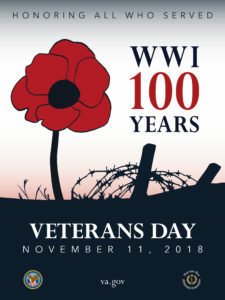 2018 marks the Centennial Commemoration of the end of World War I on November 11, 1918. The theme for the 2018 Veterans Day is: “The War to End All Wars” and features a poppy and barbed wire. New York City’s Veterans Day Parade kicks off today, rain or shine. It starts at approximately 11:15 AM (at the conclusion of the Opening Ceremony, see below) and concludes around 3:30pm.